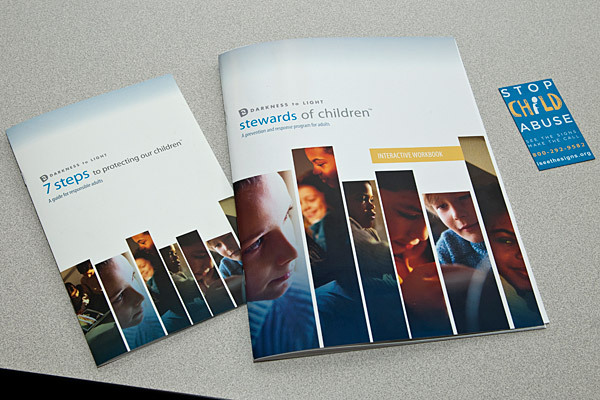 To host a Stewards of Children Event at your home, church, or civic group please contact Dawn at 806-500-9903. $30 per person (seating limited to first 20 people). Call or email Dawn at 806-500-9903 if you have any questions. 3-hour training session for your staff, volunteers, parents & anyone who works with the children at your organization. "Prevention is worth an ounce of cure." Invite Hope Harbor to your location to offer this staff and community development training. It is a great community outreach tool to let your neighbors know that children's safety is a priority for your organization or ministry. We will come to your location to offer the 3-hour training. The cost is $30 per person (material fee) and we need a minimum of 10 paid registrations. This will provide good feed back for those taking the class. We would need a room large enough for those who have registered and a TV with DVD player for the video segments of the class. Hope Harbor's Clinical Director Dawn Irons is the certified trainer for the Stewards of Children training classes. Contact Dawn for more information and to schedule your organization's training today!